It's teaser time again! This is my third week posting something from Blue Sky Days. Today it's extra exciting for me for two reasons: 1) the book launches two months from today. I seriously almost start to hyperventilate every time I say that. I'm going back and forth between happy dancing and nearly having a panic attack lol. 2) I started organizing the blog tour yesterday and I already have a dozen people signed up, plus another handful or so to work things out with. So yeah, big, exciting day for me, and I owe it all to the amazing people who have supported and encouraged me. YOU GUYS ARE THE BEST!!!! 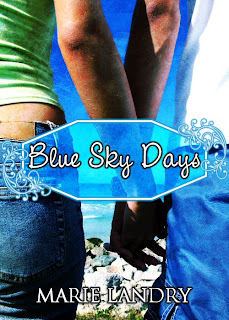 Want to be part of the Blue Sky Days blog tour? It's already shaping up to be epic. Looks like I'm going to have to add in some extra incentives for tour hosts! Anyway, if you're interested, check here for details. I had just turned nineteen that spring. The past few weeks had been unseasonably rainy, the sky stained a gloomy gray that seemed to seep into everything and affect the moods of everyone around me. People appeared to be bogged down by the weather, waiting in limbo for the rain to break so life could get back to normal. But I didn’t want normal, or at least what normal had been for me the last nineteen years. As much as I longed for sun and blue skies, I had put my life on hold long enough and I refused to wait on the weather.